The Kalman filter is probably the most successful and widely-used part of so-called “modern control theory”. It has been used as the central piece of the algorithm for many applications in aircraft/ship/ground vehicle navigation, spacecraft attitude determination, orbit determination, missile guidance and control, RF antenna/laser terminal target acquisition/tracking, RF/optical signal acquisition and tracking, seismic data processing, medical signal processing, and many other fields in the industry. This course is designed for practitioners, such as system engineers, system analysts, software engineers, hardware engineers, and project managers, as well as military operational personnel who want to develop, streamline, or enhance their knowledge and experiences in Kalman filters. Instruction provides a solid foundation for both the basic theory and practical application of Kalman filtering. Case studies illustrate the latter, including GPS navigation, integrated inertial navigation, precision navigation using GPS carrier-phase, spacecraft stellar-inertial attitude determination, precision clock, and radar/laser target tracking. The course is unique in providing participants with a ready-to-use, step-by-step approach for employing Kalman filtering to their practical applications. The instructors have a combined 50 years of experience in Kalman filter design, analysis, tuning, implementation, validation, and verification. Instruction includes detailed discussions on the hardware and software architectures of Kalman filter-based systems, as well as system integration issues, such as time-tagging and precision time matching of sensor measurements, numerical stability, and divergence prevention. Computer lab sessions using MATLAB augment lectures to help participants develop insights through hands-on experience. Using the knowledge and skills gained through this course, participants should be able to design Kalman filters for their specific fields; analyze the performance; develop the system, hardware, and software architecture; and resolve problems encountered in system integration, validation, and verification. The texts, Applied Optimal Estimation, Arthur Gelb, editor (MIT Press, 1974) and Stochastic Models, Estimation, and Control, Volumes I-III, Peter S. Maybeck (Academic Press, 1984); lecture notes; and published papers are distributed on the first day of the course. The notes are for participants only and are not for sale. Rongsheng (Ken) Li, PhD, Boeing Senior Technical Fellow, Boeing Integrated Defense Systems, El Segundo, California. Dr. Li has 25+ years of experience and is a recognized expert in the field of guidance, navigation, and control system design/analysis; software architecting/design/implementation; and system integration. He has been with Boeing for the last 17 years and was previously the system analysis department manager at BAE Control Systems. Dr. Li is the primary developer of several national high-precision spacecraft attitude determination systems as well as numerous integrated GPS/inertial navigation systems in the industry. He has 40+ issued U.S. patents and more patent applications pending related to guidance, navigation, and control. He has authored numerous technical papers and technical reports. 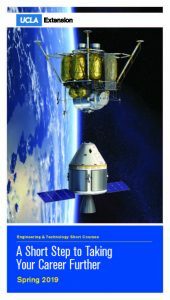 Dr Li has developed and taught several technical courses for multiple Boeing Southern California sites, including “Spacecraft Attitude Determination” and “Object-Oriented Real-Time GN&C Software Design in C++”; and this course, “System and Software Architecting,” “GPS Principles and Applications”, and “Spacecraft Attitude Control” for UCLA Extension.